On Thursday 8 November we were joined by Amy and Hannah from Stopgap Dance Company for two CPD opportunities at iC4C. 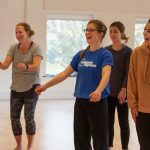 The day was aimed at Secondary level teachers, specialist and non-specialist and independent dance artists who are leading sessions with young people. As well as exploring some great choreographic tools to support working creatively with young people, the day also explored themes from Stopgap’s work Artificial Things, a compulsory study for GCSE dance. 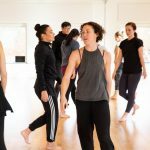 The twilight session was aimed at teachers and practitioners working in, or with an interest in inclusive dance practice. A big thank you and well done to all those who came and participated, and to Stopgap for facilitating such an inspiring day of workshops.